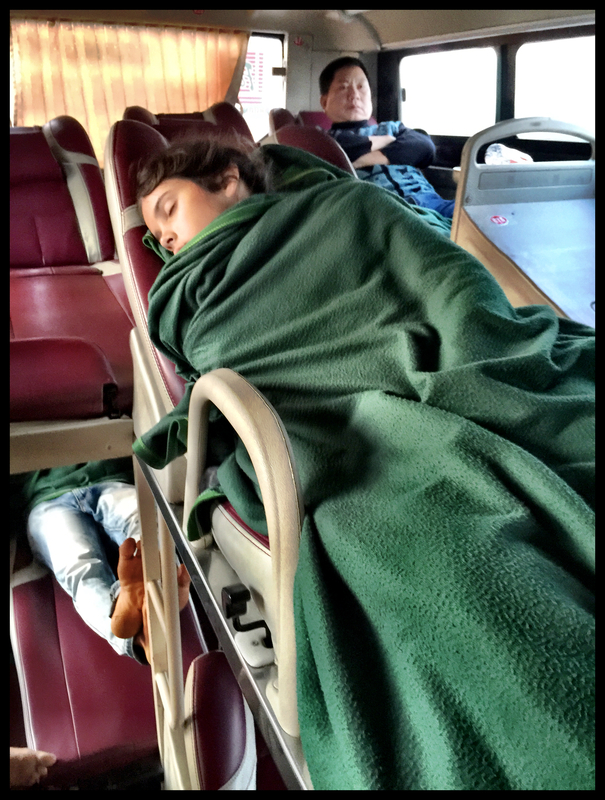 There is a first time for everything and if you’re thinking it’s the first time for a sleeper bus experience in Vietnam it doesn’t have to be a nightmare. Here’re a few things I wish I knew before the first time I tried it. 1. First Time; Maybe do a shorter trip the first time then you’ll work most of this out. 2. The Unknown; Have a look inside the exact bus type before you book your tickets if you can. 3. Seat Choices: With family groups being our focus it’s worth looking at the seats right at the back. This is not a great choice usually due to bounce, engine noise and being pressed up against the next guy. However there are sometimes 4 or 5 seats across and if thats the size of your group it may suit you better than the other single seats. 4. Seat Realities; The seats are small, tall people will suffer, claustrophobic people will suffer. The seats are plastic coated, you will sweat. 5. Cold; The air-con is often impossible to adjust; you may need a warm layer. 7. Pick up services; The Futa service that we used a few times picks you up from your hotel and brings you to your bus and vice versa at the far end. This worked fine 1 out of 4 times we used them as detailed in Grand Tour 2015 #15. ( http://wp.me/p3OJcX-7e ) One time we were forgotten and thus the last on to the bus. 8. Baggage; Don’t be the last on to the bus as your bag may be squished in the door and liable to fall out everytime someone gets off the bus. The bags nearest the doors are also the bag easiest to steal and there are plenty of stories of bags going missing. 10. Food; The food at the food stops was ok for meat eaters if you have already adjusted to the reality of vietnamese kitchens. (And if you intestines have adjusted too.) For vegetarians and picky kids it was a challenge. We could see the kitchens some of the times. Only one of our group of 4 was willing to eat at any of our stops. 11. Toilets; The stops vary with the bus services but on ours the food stop was only one that was a real toilet. Men get out and pee anywhere. Women are not really catered for. The local women have some sort of ninja bladder control but Dominique had a very unpleasant walk off into the dirt in the dark on the side of the road in the middle of the night. (If you can use one of the women peeing standing up things that might help but it might also get you more than some funny looks.) Maybe don’t have that Ca Phe with ice or the cold beer that you really crave. In fairness the whole thing is already fun to look back on. Less fun to do. We brought three significant bags on board and they took up a lot of space that we really didn’t have. The kids loved it but then the seats are actually the right size for a 10 year old. 13. Dirty Bakers Dozen Tip; Take the Train. Hey! Come on, people with square legs are always going to have a bit more bother than the rest of us, obvious init? We havnt heard from you for a while, did some official put you all back in the box? Anyway, im wrong as often as im right and my slate is far from clean, so it dosent do for me to be pointing the finger at too many people. Here’s an example, Milo and the Auld fella did a deal alright but the other way round. The Auld fella bought Milo’s farm. Yeh. I really do feel like a tulip. He was down in the Pogue buying drink for everyone (except me) with Mary smileing at him and him rattlin on about his plans. Hes off to the city to open a y-fi cafe, yeh, hes goin to call it Finnegans Awake. I have to admit i was close to puttin him sittin in the fire again. We’re out of the box. And thanks for your concern. Wifi (pronounced Wee-Fee in French) is an essential part of this whole Lego-Family-Writing-and-Righting-the-World thing. That and a moment of free time. We’ve left Vietnam but we’re having a whale of a time in Europe. European stories (embellished and otherwise) will be on the way. Tonight there is a wee story coming about a wee garden. That and Tortophobia. And another thing, you were right, the Co. Council are worth keeping an eye on. Last week i saw a piece in the local paper, The Kilfinora Kite, about a Clare Co. Co. inititive to get more turists (well, anyone really) into Co. Clare spending their money. The piece was a bit vague on what exactly they had in mind except to say that “all departments were involved”. So i decided to see what the Roads Dept. were doing. I followed them around for a few days. Well, they were going about to all the roads comeing in from all bordering counties and they were moveing the central line in the road over a bit. I measured one of them and the space between the continious white line in the center and the yellow line which marks the side of the road was 4ft 10ins on one side and 6ft 6ins on the other (i can send you a photo). It took me a while to get the confidence of the foreman but eventualy he told me that the idea was to make it easier for the motorist to come into Co. Clare and difficult to leave? Its a winner. No one will know why but I predict County Clare will be overrun with tourists in no time. They won’t be able to get out and the pubs will be full. We shall have to change the name to County Calypso. Maybe thats what the Vietnamese were doin, slowing down your departure? Maybe thats what the Vietnamese were doing, slowing down your departure? I see it now. How could I have missed it? they liked you, they had you and they didnt want to lego. 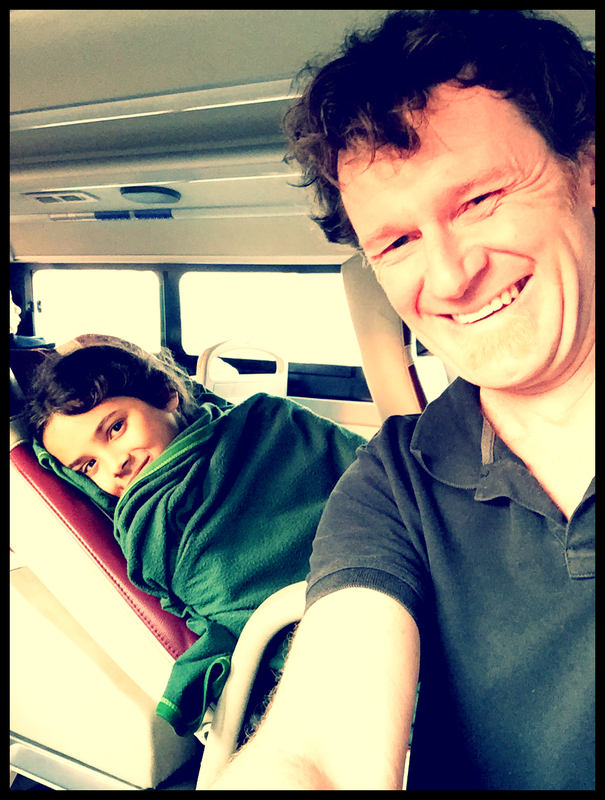 This entry was posted on 16/05/2015 by dougalynch in Children, Grand Tour 2015, travel, Travel Resource and tagged Bus, Dirty Dozen, Overnighter, Safety, Sleeper, Sleeper Bus, Things I wish I knew before...., Travel Tip, Vietnam.